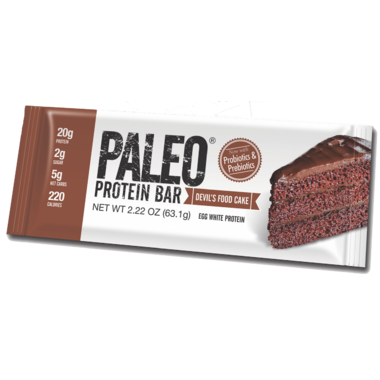 This rich chocolate tasting bar (nut free) is the best tasting and best for you bar on the market. It’s soft, creamy and uses organic prebiotic fiber & probiotics that improve digestion, curb appetite without bloating up to 4 hrs! Ingredients: Egg Whites (From Cage FREE USA Farms), Organic Prebiotic Fiber (From Tapioca), Organic Sunflower Seeds (Ground), Organic Cocoa Powder, Natural Chocolate Extract, Lou Han Guo (Monk Fruit), Produra™ (Bacillus Coagulans-Probiotic). CONTAINS: Eggs (Soy Free & GMO Free). Made In A Facility That Processed Tree Nuts. Really wanted to love this. I am lactose-/gluten-intolerant so my snack options are rather limited. This is not quite sweet enough to pass my personal taste test, and so ridiculously chewy that it borders on debilitating. Might just be me, but I don't need chunks stuck to my teeth for an hour afterward. Also quite oily to handle and so sticky I can't speak while eating. I'll pass, thanks. The dark chocolate taste satisfies my cravings in a healthy way. The bar is chewy enough to get the saliva moving (an issue for me in the mornings), but not so chewy that I fear for my fillings. The bar seems small when you open the package, but it is very filling. This is not only a tasty alternative to sweets, it's an excellent source of protein for those with limited diets. I agree with one of the commenters below, it is a great alternative to sweets for diabetics and regular people alike. We have tried a few different bars and they are tasty and have better ingredients than most bars. I tried several of the flavours from the same manufacturer and honestly they were all awful. Neither my daughter nor I could finish eating the bar. It tasted nothing like chocolate and the it left a horrible aftertaste in my mouth. I was hoping to find a less sweet, high protein and healthy alternative to a granola bar, but this is not the product. I tried several of these and this one is my favorite. It is a chewy bar, but once you chew it a bit it does have a flavor which reminds you of devil's food cake. It is a very pleasant bar to eat, and I like that it has Monk Fruit as the sweetener (only 1 gram - no added sweeteners). It is nice to have a chocolatey, sugary treat - which isn't. It satisfies the desire for that kind of thing, without the insulin shock of sugar or stevia (which, you know, also causes insulin secretion just like sugar does). If you want a low-sugar impact sweet treat with chocolate, well.. this sure fits that bill. It is an item I certainly will be ordering more of - hope you give one a try, too.